Oh Nintendogs, what have you done...there must be some kind of pet sim phenomenon going on in Japan right now. How else would you explain the success of all these animals games being released over there? 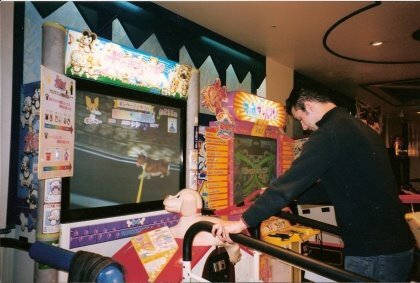 Adding fuel to the pet madness flame (that doesn't quite sound right) comes this inventful arcade game in which you walk a dog. The site I found this on says this game is found in the girl's section of the arcade. If it is, just don't tell the guy playing it.